On the South wall of the nave. THE REVD. 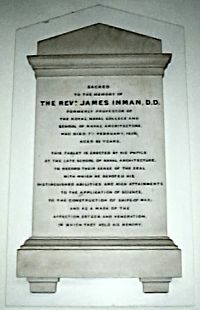 JAMES INMAN D.D. Although never a serving naval officer, Inman gained valuable experience of ships and the sea when he was recommended to the Board of Longitude by Cambridge University. In 1803 he accepted the post of Astronomer on board HMS Investigator, engaged in scientific exploration off the coast of Australia. In the following year he and many of the crew were sent home aboard East India Company ships from Canton. 'All have been kept in commission almost constantly and to none of which has the slightest accident happened attributable to error of form'.